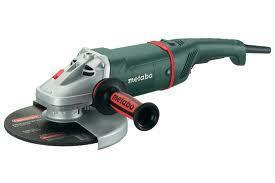 7" HIGH SPEED ANGLE GRINDER. FOR CUTTING, SCORING, AND GRINDING VARIOUS MATERIALS. BE SURE TO USE PROPER GRINDING OR CUTTING WHEELS FOR YOUR PARTICULAR JOB/MATERIAL. * Please call us for any questions on our 7 inch angle grinder rentals in Calgary, Alberta.